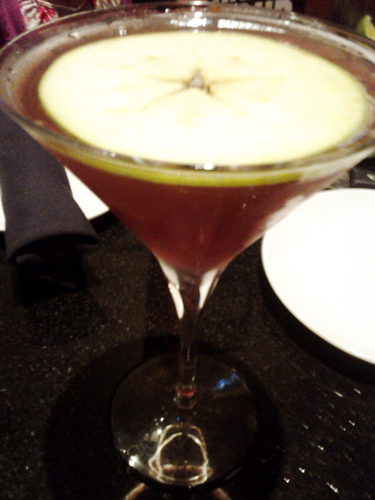 This lovely drink gets a considerable boost in appearance from that slice of pear dominating the top of the glass. The liquid beneath it is a mix of Belvedere citrus vodka, Firebirds’ sweet and sour mix, desert pear juice, and apple juice. Now, the term desert pear may refer to the prickly pear cactus found in Colorado or it may be a blend of prickly pear nectar with actual pear juice or perhaps Firebirds is just getting fanciful with labeling simple pear juice—it’s unclear from their drink description. I definitely taste standard pear in the drink, along with more apple juice than I’d prefer to boost that flavor. The sweet and sour mix has a soft presence; I’d recommend another half-ounce of it to balance out the sweetness of the juices more. The Belvedere citrus vodka is excellent as a smooth liquor for the other flavors to shine in. This is a tasty, elegant drink that needs a little pizazz.